For each stage in the business lifecycle, there are some unique obstacles that you might encounter. As soon as you have decide to set up a business, you have entered the business lifecycle, and each decision you make would affect how far the company will go. All these matter on what you decide at each step of your startup and further down the road. The business cycle would see you go from an idea to form a startup, and in case it becomes successful, you would be able to see it grow and mature into a business empire. Company formation and running it is not an easy task. You have to adapt your strategy and be flexible in your thinking as you move ahead in the business lifecycle. As per a recent Startup Genome Report, there was an estimated 90% startups that fail in their business, and the reason was mostly due to self-destruction. In short, this 90% of owners had made bad choices and were not prepared for all the stages of the startup, leaving many situations out of control. Hence, understanding the position you are in the business lifecycle will help you a lot. You would be able to defy the odds and overcome all the obstacles to success. In a nutshell, the greater your business becomes, so does your business strategies, priorities, objectives, and aims. This is the reason why you should be aware of the stages of the startup and company formation, to know where you stand and what you can do to make you succeed in each stage. For each stage in the business lifecycle, there are some unique obstacles that you might encounter. With the help of this guide on all the stages of a startup, you would be able to overcome all these hurdles during the company formation and running the company. Before you move ahead on what you need to do for each stage of a startup, there is one term that you need to understand as you will come across it often, Cap Table. A cap table is a document that describes and records the overall ownership stakes in a startup. This allows the capital structure of the company to be easily understood. The early-stage founders usually need to know and manage what is urgent, what is important and what can wait for tomorrow. And this is what you would learn from here. Under this, you would come across the five main stages of a startup and its growth along with the cap table related sections to know during each step. Our fundamental objective is to assist you in concentrating on things that are important during the company growth and help in avoiding any expensive cap table related errors during the business lifecycle. The very first stage, also called the initial phase, is the time where you are still exploring a business idea. You might already have on idea for your business, but you haven’t registered it yet as a company. Any decisions made in this stage on who owns what are usually is verbal, for instance, the 50:50 split. Let us say that you are working on the first project on weekends, in the evenings and part-time, as you still do not have any employees. During the company setup period, preparing a cap table and maintaining it can be overkill. But in case you are not the only one working for the project, there are a few crucial preliminary details that you need to record. Discuss all the details with the other co-founders and reach a preliminary agreement about what would the business’ primary ownership split be. For instance, would it be 50:50 or 60:40 split? In case your founders are lending personal funds or investing in the company, discuss all the terms for the capital that is being invested. Other than this, ensure that you discuss how the investments would impact the company ownership. Obviously, this might or might not be an awkward conversation at the initial stage, but it would positively assist you in avoiding any significant miscommunication on ownership or contribution in the future. In addition to this, just having the discussion is not all; you would need to record or capture all the discussion in an email thread or a document. It is better to have a lawyer near you when you are incorporating your company, especially if you plan to obtain VC funding in the next step. With the help of the attorney’s advice, you would know which type of business entity would best fit your company’s needs and also which state you should incorporate in. Other than that, the lawyer would also assist you through the complete incorporation process. There are many agencies out there that offer incorporation services and startup business services that can help you at the beginning of your business. Some agencies only help to incorporate in the state in which the agency is located, while some offer it in many states. Additionally, the most popular and best place to incorporate your company are Delaware, California, Wyoming and Nevada. Connecting with a local agency would help you have all your primary startup needs fulfilled and you would have your business registered and incorporated in no time. So, if you are all ready to embark into the competitive business world of US, then IncParadise should be on the radar. They will help you in checking name availability, filing Articles with state, and preparing Articles of incorporation. One of the main benefits of being an early employee or a co-founder is that you get the chance to file the 83b election with the IRS. Basically, filling this would reduce the taxes that you pay as the company grows and also makes purchasing your stocks affordable in case you decide to liquidate your business. To explain it better, any person who has the stock that is subjected to the repurchase option (aka deferred compensation) in the company can profit if they file an 83b election. Amount of individual start date of each founder, stock issued, and the vesting schedule. Amount of stock in the employee option pool. During the creation of an “issued” pool and “authorized” pool of stock, determine how many shares of the company you may have to issue to the consultants and the employees within the next 12 months. It is vital to understand that the cap table is just a summary of the shareholdings and it is not a legal document. In the cap table, you would only find the outlines of the stocks, options and the warrant issuances. These have been documented in a different, board-approved document like the stock option agreements, stock purchase agreements, etc. Do you want to manage your shares? If you are business owner or professional, you can start issuing and managing shares all online. Try out our Eqvista App, it is free! Most of the founders normally record the details in the cap table during the company formation and before the approval has been made. However, it is crucial to make the entries again when the update comes with the correct dates. The shares are never officially approved unless and until the board approves them and the purchaser/grantee as well as the company sign on the agreement for the stock purchase. At first, by compiling all the stock options which have been provided to date, the cap table of the company would act as a significant tool to manage the option pool. This would have who has been given what, how they are going to vest and it would help you make sure that everything is according to plan. Secondly, if you are deciding which is fair for every contributor, the cap table would help you for comparing the grants. It would help you understand what each person is giving to the company’s success and for making sure that the presentations are proportionate. To make things easier for you, you should define each offer as the number of shares and not as a percentage of the business. The reason the number of shares is better than a percentage is because percentages are ambiguous and immediately turn to become inaccurate as the business expands. This number of shares will matter for the overall company as well as each individual shareholder of the company. You can also consider incentives to employees in the form of shares that would be vested over a certain period of time. This would be both helpful for the company as well as the employees would be happy with the situation and how the company rewards them. But before you make the numbers, discuss all the details about the vesting structure. Usually, a 2 to 5 year vesting schedule is taken up. Moreover, it is normal for a startup to grant the restricted stock from the stock plan of the employee until the time where the company has raised an equity financing. And that is when the company then spends money to get the 409A valuation and begin granting the stock options. The 409A valuation addresses all the risks of the IRS arguing with you later on regarding the value of the stock and the taxes that people owe. The cost of the valuation is approximately $2,000 and there are a few places that also offer this service free of cost as part of building relationships. As a matter of fact, it is vital to know that the employees get more benefits from the restricted stock as compared to options. Hence, if you want to become employee friendly from the initial stages of the startup, it is advised to provide them with the restricted stock as long as you can and till the 409a valuation or the par value is negligible. Nevertheless, restricted shares also mean that there would be a burden on the administration work. And in case you do not take the right steps for reclaiming the unvested shares when an employee leaves, then they are defaulted to get them. If you are at a pre-equity stage and are still offering the restricted stock to the employees, ensure that you record this in the cap table. Along with this, it is also important to note which of the employees have filed the 83b election. You would also need to record all the details of each employee or even the founders who have moved on even if it has been long since the company formation. Along with this, you would also have to note how many options were vested and how many of them were utilized by the person upon leaving and/or even bought back from the company by the person. This is when you are about to begin raising the seed capital through the bridge rounds, convertible notes, etc., but have not yet got to the Series A stage. Do not get too confused; in seed funding, there are three stages called series A, B, and C which correspond with the development stages of the company that raises capital during the company setup. Who is getting what, and who owns what. They check if the team is incentivized to both see the project through and hard work. What are the other warrants, notes, etc., that are in place and how would they change at Series A. How many of the employee option pool has already been issued and how much of that persists in encouraging the hiring strategy. The moment you close the convertible note, its conversion features also have to be recorded in the cap table. Furthermore, the notes and any of the other pre-equity instruments like SAFE and the warrants usually have some features that define how they change to equity upon a future equity funding. A note’s “cap” or “discount” multiplies its purchasing ability throughout a succeeding Series A round compensating the seed stage investor for their early bet. The moment you make the decision to raise funding and assuming that you have some investors who are interested, it is important to think about the amount of cash you need for your business and what you are ready to give in exchange of funds during the initial stages of the startup. Potential investors sitting on the other side of the negotiation table have an opinion on your chance of success, exit value, the percentage that they want and how much money are they ready to pay for it. And for all this, the cap table is crucial. At first, it is vital to have an accurate and proper cap table. Any red flags or errors can cause a delay in closing the deal, make the investor strike a harder deal, or make you lose the contract. Next, if you have done a good study on the various scenarios, you would be able to negotiate a deal favoring you. Let us say that you want to gain funding of about $500,000 for your startup and you missed out on some details in the cap table. When the investor calculates the shares and the stock of the company on your business proposal and cap table to find out something is missing or fishy, the investor may deny to offer funding to the company. In short, the cap table has to be in order, accurate and filled with the right details so that you can easily obtain funding for the company setup. And with this, it is also important to have all the facts straight and right in place. 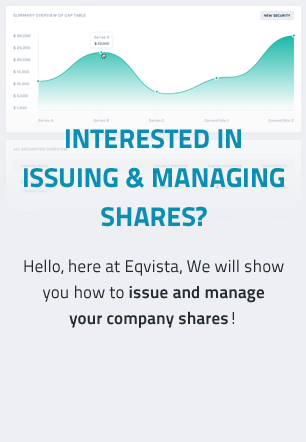 Issue & Manage shares with EqvistaGET STARTED, IT’S FREE! Keep the endgame in mind – It is important for you to know how the terms of a convertible note or how much money you obtain can affect the ultimate outcome for the founders, staff, and yourself when deciding how to divide the shareholding of the company. Keep everyone on the same page – The mismatched expectations due to a financially unsophisticated employee, a clerical error, or a misremembered promise can lead to disappointments, rifts, and even legal action. Keep track – As mentioned above, the cap table is not the main document record. It is the summary of all the documents recorded in one place since the company formation. It is vital to keep your table updated as omitting one grant too can threaten your series A funding. Also, it is important to ensure that all the records on the table are true and have been approved by the board. Eqvista is a tool that has been developed for the founders so that they do not have to hire expensive professional help for this little task from the initial stages of the startup. It can help them in making and managing the cap table in a much easier and secure way rather than using a simple spreadsheet. However, before you can begin using it, it is also essential to understand what shareholders are what role they plan in business. The next section would give you a much better idea of it as well as explain all the other details.